I was browsing my local guitar shop the other day and saw the Ibanez S Series S970CW hanging in their racks. I have to say that the guitar just jumped out at me because of its drop dead gorgeous looks that just made it stand out against the other guitars. So I had a quick play and this is what I think of this great looking instrument. 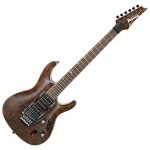 The Ibanez S Series is a range of guitars introduced by Ibanez in the 1980s. The S series , with the S standing for sabre, was produced by Hoshino Gakki and was designed to have a lightweight and streamlined mahogany body with a maple neck. The combination was designed to be comfortable and super fast to play but without losing any of the natural resonance that mahogany provides. The S series has gone on to prove itself as a mainstay of the Ibanez stable and the names of those players who play S Series guitars is like a whose who of the guitar greats. The Ibanez S Series S970CW sits firmly in the super strat, super premium camp and boy does it look the business. The solid mahogany body is streamlined and contoured perfectly to fit the body giving a comfortable fit that makes you forget that you are even holding the thing. The solid mahogany body is fitted with a Claro Walnut top which has a natural finish making this a real thing of beauty. Sorry but we can wax lyrical about the look of wood until the cows come home. The neck is the Ibanez 5pc Wizard Maple/Walnut neck fitted with 24 jumbo frets which is beautifully sculpted for the speed demons amongst us. On the Ibanez S Series S970CW, because of the price point of the guitar, the frets have been given a premium fret edge treatment to produce a super smooth edge. The fret treatment, normally found on much more expensive guitars, is produced by a hand crimping technique leaving the frets with a smooth edge leading to a more comfortable playing experience. The Ibanez S Series S970CW is fitted with a ZR II bridge w/ZPS3 zero point system which, because it has no friction points makes it the smoothest and most stable Ibanez back stop ever. An additional outer pair of springs provides easier tuning and better tuning stability than the traditional floating tremolo, plus the other strings will remain in tune if a string breaks. So if you like your whammy action hard this guitar is custom designed just for you! Fitted with two humbuckers in the neck and bridge position and a single coil in the middle position this guitar can handle just about any guitar sound you want to produce. The pick-ups themselves are Ibanez CAP pick-ups which give the player lots of options in terms of tonal range. Plugged in this guitar can be played nice and clean or down and dirty and won’t skip a beat highlighting the true versatility of the guitar. As I said at the start of this article the thing that first got me looking at the Ibanez S Series S970CW was its looks. This guitar is incredibly well built! However, looks aren’t everything and I have been let down by good looking guitars before. Thankfully the Ibanez S Series S970CW does not fall into this ilk of guitar. The guitar has substance to back-up its style. For me that makes this guitar worth every penny so if you are looking for a versatile guitar that can handle just about everything musically that you can throw at it then it is worth putting the Ibanez S Series S970CW on your shopping list. Scale length 648 mm / 25.5"